2011 was a pretty good year; in spite of getting off to an inopportune start. 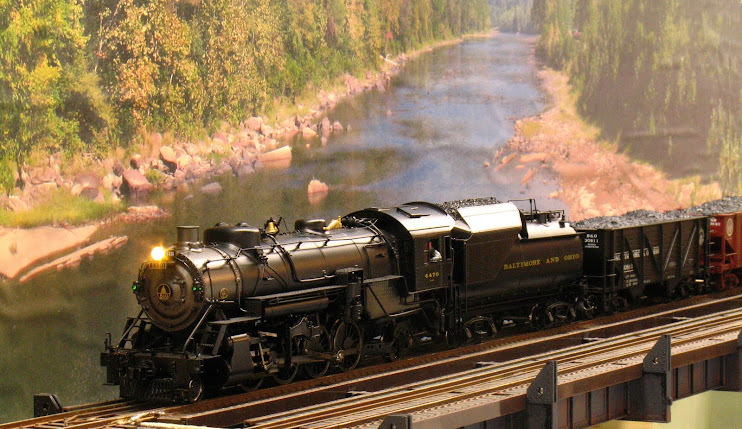 The year began with my first Open House for the Baltimore/Washington O Scale group on Jan. 8. A flurry of activity during the Christmas week just past had brought the layout to just about 70% of the way around the walls of the basement; not much to show for 3 1/2 years of construction. Jan. 8, 2011 saw a light snow on the ground here in Virginia which deterred several people from attending (snow in any amount usually shuts things down here in VA). To make matters worse, a careless driver went whipping around a turn in the slick snow, couldn't hold the turn, crossed the line and wiped out my wife's car as she was on the way to pick up the 6' sub for our lunch! 2011 was off on a bad foot. Despite all of that 11 people attended the Open House and I believe that a good time was had by all. About mid-year the previous year, I had an idea for staging tracks and a reverted loop that I had not included in the original plans; but, if they were to be built at all, it had to be done before the main line progressed too much further. Building what I came to call hidden staging took a lot longer both before and after the the open house than I had anticipated. The first trains were not ready to run in hidden staging until the latter part of July 2011 (Aargh!) see First Train Runs in Hidden Staging. From there on out, it was preparation for my second open house which I had committed to for Sept. 10. In the couple of weeks leading up to the second Open House I put in the Tray Run Viaduct trackage and almost all of the rest of the Cheat River Grade. (see Work On The Mainline Resumes and More Progress and T Minus 5 and Counting and D-Day). Nothing like a deadline to concentrate your efforts. After the open House, the Cheat River Grade backdrop went up; see A Backdrop for the Cheat River Grade. Finally, the year closed out with construction beginning on the helix; see Construction of the Helix Begins. Between all of this I produced three instructional videos (Fast Tracks Tips and Techniques, Install a DCC Decoder in a Brass Steamer, Photo Backdrops Made Easy) several smaller videos and several instructional postings; had my first published article and appeared on many episodes of Model Rail Radio. And, oh yeah, my day job was pretty demanding as well. Although I would liked to have done more, 2011 has been my most productive year. Looking forward to 2012, I want to complete the helix and at least one track on it by my next Open House, Apr. 21. After that, I hope to have the golden spike ceremony for completion of the main line by the end of the year.